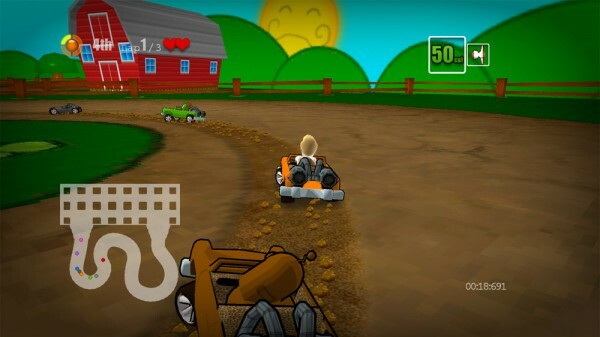 Dirchie Kart was developed by BrownBot and released on January 22, 2011 and costs 240 Microsoft Points. A copy was provided by the developer for review purposes. The rise of indie development in games has been a boon to various elements of the games industry. While innovation is often the result of the tight focus of smaller development groups, indies also have a unique ability to revisit old ideas and breathe in some new life. 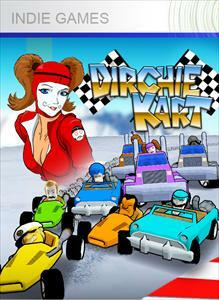 Dirchie Kart is a solid attempt at this, reviving the Super Mario Kart formula in a glorious and unflinching fashion. 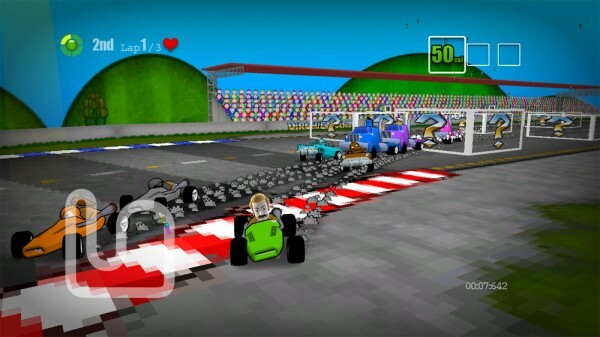 Art style – BrownBot was clearly aware of how blatantly they were aping the gameplay of Super Mario Kart, as they integrate cute little references into their art style that nod to the older title. Blocks scattered around the race course display a big familiar question mark, while the environments are highly pixelated and feel reminiscent to SMK’s blocky walls and textures. Power slides – As a common modern game mechanic, power sliding is often taken for granted and thought to be just another tool in the arsenal of a racing game fan. In a game as uncomplicated as Dirchie Kart, mastering the power slide is both challenging and highly rewarding. The execution of attacks coupled with how long and when to attempt a power slide can make or break a race, especially in the heat of competition in a local match. Customized experience – In addition to the power slide, Dirchie Kart adds different car types and a shop mode to the Super Mario Kart formula. The former allows the player to choose their style of play, with a small car focusing on speed at the expense of item capacity and health for example. The latter is a system of item distribution that you can choose at the start of a race, allowing the player to choose what items to add to their arsenal based on the number of coins collected in the previous course. Stronger or more focused attacks beg a higher cost, but retrieving the coins in a race can risk your standing in the present. The two aspects lend far more replayability and diversity to an otherwise rote experience. Poor track design – While the tracks in this game may have character in their visual aesthetic, their design with respect to gameplay often borders on terrible. Crashing into one of many corners in each course can ultimately sabotage any chance for success, as the only way to escape is by using the laborious reverse. Falling off a ledge often forces a respawn very close to the point of failure, meaning the chances of falling off the very same point are mercilessly high. Lack of rubber banding/undeveloped AI – One of the Mario Kart series’s biggest assets is dynamic AI that adjusts the difficulty based on the fortune of the human player. This game has no such system, with computer players unabashedly leaving their flesh and blood counterparts in the dust with the smallest mistake. Beyond that, the computers seem to have no sense of strategy based on the type of kart they choose, with the slower but hardier characters barely using their size and power to get any advantage. Computers equipped with the fastest karts inevitably win every race, only to be stopped by the dynamic behavior of a human. While Dirchie Kart takes the basic formula of the Super Nintendo Mario Kart title and adds to it in many important and game-improving respects, it falls short in a handful of key ways that make the single-player experience somewhat tedious. Much like its Nintendo counterpart, this game is likely to find far more fans in local competitive settings where AI plays a backseat role to the fun of playing with friends. Nonetheless, Dirchie Kart is certainly worth a try for anyone who has fond memories of more traditional kart racing fare.